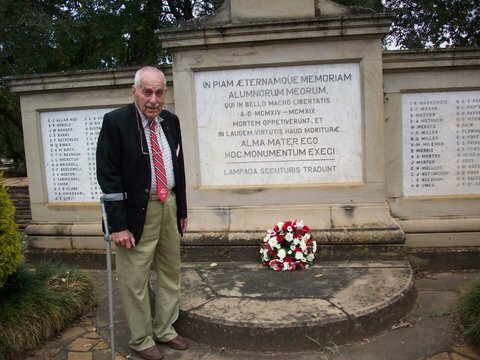 So the old man went to Maritzburg College for their 150th anniversary 1863-2013 on Saturday. Sheila ignored his protests and arranged it all, including getting free tickets. He’s 91 and was in the 1938 matric class when College was a mere 75yrs old. He bailed out around April and went to work for the GPO – general post office – then off to the war as soon as he could. Wonder what memories were swirling around here? Walking up to your familiar school entrance seventy five years after your last walk up that path. He thought he’d be the oldest there, but he was trumped by the only other chap from the 1930’s: 97 year old Cyril Crompton – Matric 1933!! How’s that head of hair!? Cyril had driven down from JHB on his own! – watch out on the roads! He’s driving back on his own tomorrow, but will be stopping off in Underberg to play bowls. My old man believes in much activity. He does woodwork and metalwork, making clocks, furniture, mosaics and turning wooden bowls, etc; Drives around buying stuff at auctions, butcheries, SPCA sales, etc. Talks about selling stuff, but seldom gets round to it – too busy buying stuff! He firmly believes “keeping busy” is the reason for his longevity. So he asks the older Cyril: What do you do to keep busy? Cyril: Oh, a bit of gardening. The rest of the time I drink beer. Cyril gave the old man a book he wrote on the war. They were both in North Africa and Italy. In his book “For The Adventure Of It” he writes how he survived the Battle of Sidi Rezegh, one of the most costly in lives in South Africa’s history. He was captured, the ship was torpedoed and he was taken on a death march from eastern Germany – now Poland – away from the advancing Russian Army. A gripping story. Footnote: Cyril lost his drivers licence due to failing eyesight at 99, played bowls till he was 100, then passed away. Dad has renewed his drivers licence at ninety five and eight months, valid for five years! Read a lovely article in the Sandton Chronicle about Cyril when he turned one hundred. In it he says “My secret to a long life is Castle Lager and cane spirits, my two favourite drinks.” Funny that: For years we listened to Dad expound how the secret to him not being as bad as other drinkers was cane spirits and water. The colour in brandy and whisky was somehow bad as were mixers according to him. Read about his book at Echoing Green Press.